With her breakout 3-lb. cookbook Mastering the Art of French Cooking (co-authored with Simone Beck and Louisette Bertholle) and subsequent public television show The French Chef, Julia Child not only introduced meatloaf-reliant Americans to the delights of French cuisine but also enlightened a fine-food-fearing nation that cooking should be a craft, not a chore. The hearty wife of an American diplomat, Child honed her culinary skills at Le Cordon Bleu while the couple lived in Paris, breaking down the barrier that up until then had reserved gourmet kitchens for male chefs. For a decade, Child entertained viewers with her casual approach and free spirit, proving that anyone could be a good chef with the "freshest and finest ingredients" and a good dose of butter. "Our Lady of the Ladle," as TIME dubbed her in 1966, became America's most beloved chef, all the while changing the nation's appetite and attitude toward fine food. 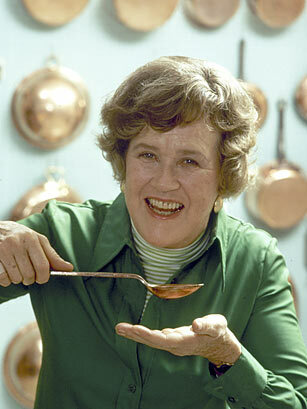 See TIME's 1966 cover story on Julia Child: Everyone's in the Kitchen.